We’d love your help. 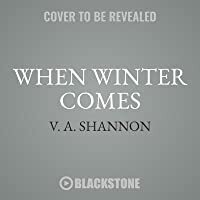 Let us know what’s wrong with this preview of When Winter Comes by V.A. Shannon. Mrs. Jacob Klein has a husband, children, and a warm and comfortable home in California. No one—not even her family—knows how she came to be out West thirteen ye In the voice of an unforgettable heroine, V.A. Shannon explores one of the most harrowing episodes in pioneer history—the ill-fated journey of the Donner Party—in a mesmerizing novel of resilience and survival. To ask other readers questions about When Winter Comes, please sign up. It has been 13 years since Mrs. Jacob Klein came west to California. She doesn't like remembering her journey west. She has three children now and a husband....and she doesn't want them to know she was part of the Donner Party. She wants to keep the horror of that winter in the wilderness a secret. Some of the survivors have made money or gained fame from telling partial truths about their experiences that winter....but she doesn't want to risk the truth destroying her new life with her family. It has been 13 years since Mrs. Jacob Klein came west to California. She doesn't like remembering her journey west. She has three children now and a husband....and she doesn't want them to know she was part of the Donner Party. She wants to keep the horror of that winter in the wilderness a secret. Some of the survivors have made money or gained fame from telling partial truths about their experiences that winter....but she doesn't want to risk the truth destroying her new life with her family. This book switches back and forth from Mrs. Klein's present day to her experiences as part of the Donner Party in the winter of 1846. I don't usually like books that jump back and forth in time, but for this story it worked nicely. Mrs. Klein is hiding so much from her family...she hides behind her married name, never revealing really who she is while telling her story. Some secrets are just too much to share...too dangerous, too revealing. She chooses to remain silent, rather than tell half-truths like others have done. Mistakes. Rough choices. Consequences. Starvation. The Donner Party is remembered for all of those things. This book adds a human element to the story we've all heard many times before. It isn't all doom and gloom. The author mixes the horror and desperation with courage, optimism and hopefulness. When I was all done with this book, I had to sit back and think for awhile to ascertain what I think about the narrator. Mixed feelings. On the one hand I find Mrs. Klein to be courageous, strong and intelligent. But on the other hand, I find her secretive, manipulative and maybe even a bit weak in that she can't tell the truth about herself for fear that her family will be horrified. I can understand it....and yet, it made me feel a bit of negative emotions about her. So strong in the face of danger....yet so fearful of telling the truth about the experience. I would suppose if I had something of that nature in my past, I would want to hide it from friends and family as well. And I would be very upset at others using the situation for personal gain, especially if I knew they weren't telling the whole truth. Interesting and creative story. I am definitely looking forward to more by this author! In the past I have read stories of the Donner Party, one of the most unfortunate wagon train trips ever to happen. Though this book is fictional and we may never know exactly what happened with so many different exaggerated stories being told by survivors this is based on true harrowing facts. In 1846 on the outskirts of Cincinnati hundreds of wagons gather to make the trip to California among them a brave fifteen year old girl who just knows a new start at life would be better than staying behi In the past I have read stories of the Donner Party, one of the most unfortunate wagon train trips ever to happen. Though this book is fictional and we may never know exactly what happened with so many different exaggerated stories being told by survivors this is based on true harrowing facts. In 1846 on the outskirts of Cincinnati hundreds of wagons gather to make the trip to California among them a brave fifteen year old girl who just knows a new start at life would be better than staying behind in her abusive home life. She hires on as a helpmate to a family with a young child and another on the way. No one who started out on this trip could have foreseen the horror they would endure before journeys end, those who even survived the journey that is. True showing of such human resilience. Mrs. Jacob Klein has a husband,children and warm home in California. She doesn't talk about it and no one knows what happened to her 13 years ago, not even her husband. She intends to keep it that way and continue living her boring but ordinary life. Her husband gives her a journal for Christmas and she starts recording her past life events for her eyes only, at least for now. Our main character, only introduced by her married name Mrs. Klein, takes us on a long journey from hometown Cincinnati to the new state of California. We are part of the 1840's wagon train to the new frontier. A rough journey through a diverse and unforgiving landscape. We get to know the different families, their traditions and values, their place in the order of things. There are friends and rivals, laughter and sadness, some fierce tempera Thank you Netgalley and Kensington Books for the ARC. Our main character, only introduced by her married name Mrs. Klein, takes us on a long journey from hometown Cincinnati to the new state of California. We are part of the 1840's wagon train to the new frontier. A rough journey through a diverse and unforgiving landscape. We get to know the different families, their traditions and values, their place in the order of things. There are friends and rivals, laughter and sadness, some fierce temperaments and deaths along the way. The survival of the fittest, eventually arriving at Sutter's Fort. The story is told from the New World, through the journal of Mrs. Klein. At first she's not sure she has anything to say, but does she ever! 'When Winter Comes' is a story of dreams, struggles and never giving up. Told at a pleasant pace, this is an impressive piece of American settlers history. When Winter Comes is an engaging and emotive fictional account inspired by the true Donner Party events. Switching between past and present, V.A. Shannon skilfully told a story that kept my interest throughout. Gripping story with interesting and well crafted characters. Hope and tragedy and impossible choices. Shannon definitely knows how to write emotions. I really felt for our main character. Known to reader as Mrs Klein, she starts the journey as a rough and neglected young girl who grows to be When Winter Comes is an engaging and emotive fictional account inspired by the true Donner Party events. I really felt for our main character. Known to reader as Mrs Klein, she starts the journey as a rough and neglected young girl who grows to be a courageous and kind woman. When Winter Comes is a fictionalized account of the Donner Party as they travel to California told by Mrs. Jacob Klein as she reflects back on her experience. This should have been an emotionally charged read for me but I felt no connection with the characters given the circumstances they found themselves in and the horrifying conditions of freezing and starving in the mountains while trying to figure a way out. Thank you Kensington Books and Netgalley for a free e-copy. Wonderful historical fiction, I loved it and couldn't put it down. I consider myself very fortunate to have been chosen as one of the recipients of a copy in advance of publication. My advance review copy is now well creased, as I read this remarkable novel in bed, on the bus and crammed it in my handbag to take to work, I was so engrossed in the story. Quite recently I read another fictional book with a supernatural angle The Hunger based on the same true subject, the Donner party of pioneers wh Wonderful historical fiction, I loved it and couldn't put it down. I consider myself very fortunate to have been chosen as one of the recipients of a copy in advance of publication. My advance review copy is now well creased, as I read this remarkable novel in bed, on the bus and crammed it in my handbag to take to work, I was so engrossed in the story. Quite recently I read another fictional book with a supernatural angle The Hunger based on the same true subject, the Donner party of pioneers who came to grief, back in the mid 19th century when thousands of brave and some plain foolhardy, folk set off with their wagon trains to cross the Sierra mountains from Cincinatti, headed West towards California to try and build a better life. What bravery, how hard it must have been in these days centuries before tripadvisor and google maps and without even any real trail or markers to follow. Both these books are wonderful, yet rather different accounts of the same true journey. When winter comes is told in the intimate first person voice of a young woman who leaves her poverty stricken feckless and violent family home, following a series of mishaps. The book begins in 1859 when our narrator is a rather sedate married woman, living a quiet life of domesticity bringing up her girls, meeting up with her friends at a quilting bee, and looking after her husband, Jacob, who presents her with a journal as a gift. As she begins to put pen to paper she is unsure what she will write about as every day is the same. But as soon as she begins, memories of her past come flooding back and memories she had suppressed clamour to be told. In a series of flashbacks to 13 years earlier when she was just 15, we learn how she became involved with the fated journey of the infamous Donner party and her version of events unfolds in all its grim pathos. We watch her grow and change from quite a selfish young madam into a reliable and stoic young woman. This is a coming of age born of necessity and hardship that I wouldn't wish on my worst enemy. The descriptiveness of being part of an epic journey in times gone by are painted with a deftness and utter plausablity, that makes the reader experience rather than merely read the story. It reads like a memoir and gives you an insight into a fictional characters thoughts and actions around a true event. It is captivating and harrowing by turn, beautifully thought out and well written with evidence of much in depth research. If you like historical fiction with a literary quality and a whole host of characters all the more real for their flaws and foibles you'll LOVE this book, I did. As the author of this novel I thought it might be a nice idea to just write a little about it and the background to my writing it. So first, my one-line synopsis - "An everyday story of quilting and cannibalism". Other than that I can't really categorise it. It's got a love story in it, but it's not a romance; it's got some murdering and a few Hannibal Lecter-ish moments, but it's not a horror story or a detective-y thriller. It's basically just a story set in pioneer California in the nineteent As the author of this novel I thought it might be a nice idea to just write a little about it and the background to my writing it. So first, my one-line synopsis - "An everyday story of quilting and cannibalism". Other than that I can't really categorise it. It's got a love story in it, but it's not a romance; it's got some murdering and a few Hannibal Lecter-ish moments, but it's not a horror story or a detective-y thriller. It's basically just a story set in pioneer California in the nineteenth century, about a woman living a life of domestic tranquillity whilst hiding a terrible secret. This novel started life as a small part of another (contemporary) novel but an agent I sent it to said he'd be more interested in the straightforward historical narrative so (sadly, miserably) I discarded all my carefully crafted two-years' worth of contemporary plot and started over with just the historical bit. I have to say I loved writing it; very time consuming as I was compelled to research every single little thing (When were sewing machines invented? What hymns were sung in California in 1846? When was icing sugar invented?). I sent the novel to an American agent who signed me up and got me a publisher super-speedily and then I had to write the whole thing again with American spellings, which has made me forget how to spell in British English, now. I could write on and on but won't; but do please contact me if you have any questions or comments!!! Our narrator throughout the journey remains nameless. We only know her as a 15 year old girl, running away from a poor abusive family who joins a wagon trail heading west from Cincinnati to California to find land and settle for a better life. She finds a young couple willing to take her with their wagon, to be there as a helper to them and their young daughter and full of optimism and When Winter Comes is a fictional story inspired by the true historical events of the Donner Party in the 1800s. This is a very gripping, fictional account about the Donner party. The author dug deep into their desperation and sorrow. This is not an easy book to read, but the author did an excellent job of putting the readers on that trail with the doomed wagon train. 1846 Cincinnati, this story starts with a 15 year old heroine, who escapes her abusive father and trails along with hundreds of wagons heading to California; as people are lured by the stories of riches, good land with beautiful landscape and blue cloudless sky. When they reach the east side of Sierra Nevada mountain range, they split into two groups. One group led by Donner Party decides to take an unknown shortcut in hopes of making to California quicker as they are running out of provisions. But what lies ahead of them are treacherous mountains, which slow their progress tremendously. And the snow comes earlier than expected. They have to stay on the east side of the mountains until the snow melts. This past time story is intertwined with the present time story, both told by the heroine, who wants to make sure that a true account of their journey is given as she hears many lies being told by other survivors. It is also interesting in a sense that it gives the past time story a flavor. As the struggle of the journey might have gotten monotonous at times, it is entwined with the information how California becomes a state and joins the Union. It also gives a sense how different life is back on the east coast. When the first pioneers struggle to make a living in California, the east coasters are fighting for women rights or northerners to abolish slavery. I also enjoyed reading about the first immigrants in Cincinnati as well as the encounters with the Indians. All those historical accounts give the book a great flavor to this tragic story of survival. This book is a fictional account of a true story. I, too, have read the novel The Hunger which is a very different take on what happened. The story begins as the narrator, now a married woman living a quiet life in California with her husband Jacob and three daughters. She spends the day cooking, cleaning, gardening and spending time with her quilting bee friends. When she receives a journal from Jacob at first she is afraid of writing anything down. But she picks up her pen and the story of her life pours out. She begins at age fourteen living with her abusive and drunk father and her mother who is selling herself and is also a drinker. When sold to a riverboat gambler, she pushes him away and he hits his head. She runs from the scene and joins a wagon train heading for California. She is taken in by the Keesbergs. She is rather loud mouthed and sarcastic at first, but gradually changes when she looks about her and realizes her lack of maturity and situation. When an ill-fated decision to take a “shortcut” is made, the small party of wagons, including the Donners (who feel themselves somewhat superior to the rest), the Reeds (Mr. is so full of himself he is insufferable), Mr. Eddy (who tells tall tales and embroiders his every pronouncement), Mr. Hardkoop, the Breens and many others. Tempers begin to flare and several accusations are made. The people began to show their prejudices and perhaps their true colors. The balance of the tale tells the story of a cruel winter spent in the mountains called the Sierra Nevada. There are several children with them. When they can’t go any further, they built shelter (such as it was), but ran out of food. All of the beef and horses left has been slaughtered and long since consumed. They were relieved by the intermittent arrivals of rescue parties, but not enough food was left. Some folk decided to walk out. This tale is very sad – and somewhat hopeful. Ms. Shannon brought the individuals to life. In colorful and painstaking detail she recounts a horrible story of survival (at least for some). She describes the bitter cold, the depth of the snow and how heartrending and difficult the circumstances in those little ramshackle lean-tos were. She undertook very exhaustive and detailed research. The writing is very good, as is the plotting. I truly enjoyed this book, horrible as the subject matter was. I immediately went to Amazon to look for others of her novels. I want to thank NetGalley and Kensington for forwarding to me a copy of this informative and well-researched book for me to read, enjoy and review. It was a great storylines, especially her going through in camp out at the mountains..I just couldn't believe that so many peoples and their kids had died at the mountain..
"An everyday story of quilting and cannibalism." I almost spit my coffee. Its easy to judge from the perspective of a safe, warm home, plenty of food, good trustworthy family and friends. The Indian saying about walking a moon in anothers shoes before judging is a good one to bear in mind. Who knows what we'd do when faced with death? We get the story from Mrs Jacob Klein, now a well respected person, wife and mother. Her husband Jacob doesn't figure largely in this story, and yet I get the feeling he knows what happened, he saw how harrowing the journey had been for his wife, and his decision right at the start to tell her he would never ask gave her a peace of mind. She didn't love him when they married, but over the years that respect and trust has grown, and I feel she does love him now, not with a grand passion, but with a depth that is solid, means more to her. When we first meet her she's one of many, families struggling to survive, parents who don't care or have given up caring, and just use whatever they can to scratch a living, steeped in the alcohol that helps them forget for a bit how hard life is. That's her future, selling her body, unless she takes charge, and when the opportunity comes she grabs it, and runs, out onto the trail with folk hoping for a new life. Its hard, she's on her own, tagging on to a family by their goodwill, and need for her help. Things go wrong of course, days are long, life is tough but somehow they're getting through. Seeds are sown, moments of distrust, stories embellished, accusations and insinuations run riot, as happens with any large group, but so far they are making progress. Not without losses, but they all expected that. Then someone comes up with a shortcut, tells some of the others they'll get there ahead of the main group if they take it, they'll get the best opportunities, the best land, the best grazing, be wealthy, and the infamous Donner Party sets out. As always though there are those with loud voices who make money from the story, not by telling the truth of course, but by presenting themselves in the best light, and by talking down and blaming those who they've held grudges against for so long. That's human life, that still happens, never let the truth get in the way of a good story is something we see today in the news all the time. Some things never change, but those lies can decimate anothers life. I lost interest in this book about half-way through. It was depressing to read a view of a well-known historical event from a non-existing character. Although no one knows the true and complete events of the Donner Party, I had no sympathy for the narrator, either as a young girl or adult. "Hunger is an evil thing, and brings with it the worst of human nature; it is an agony of the flesh, but it is an agony of the spirit as well." Most people who have even a passing interest in Pioneer times have heard one or more versions of the story of the Donner party's trek from Ohio to California which ended in murder and cannibalism. WHEN WINTER COMES is a new fictional version of this true tale. Told thirteen years after the survivors arrival in California, this tale is written in story fo "Hunger is an evil thing, and brings with it the worst of human nature; it is an agony of the flesh, but it is an agony of the spirit as well." Told thirteen years after the survivors arrival in California, this tale is written in story form, but as if it were being written in a journal rather than spoken out loud. Mrs. Jacob Klein was but a young teenager when she set out in 1846 with nothing more than the clothes on her back to join a wagon train heading from her birthplace in Cincinnati to the wonder of a new life in California. Her husband Jacob has no idea what befell her on her journey and does not try to force her to relive those memories. However, his gift of a beautiful, blank journal prompts her to fill it with the recollections of the very worst time of her life. "My eyes blur with weariness, and my hand cramps. But my mind will not be still. It pours out memory like a never-ending stream of water that cannot be contained." Author V.A. SHANNON writes about the camraderie the members of the wagon train experienced at the start of their journey. As time and hardship start to wear on the pioneers, that early easy camraderie starts to erode. What happens next is NOT the same as what has been reported and believed for the last 150 years. Author V.A. Shannon seamlessly leads the reader between the narrator's journal entries and her present reality. Not only is this a historic tale of survival, it is also a coming of age story. In fact, it is also a study of humanity and of what people are willing to do, and what lines they will cross, in order to survive. How far would you go to ensure your survival? What would you be willing to do to ensure the survival of your spouse? What about for the survival of your children? Would you allow social conventions and the fear of what others would think of you to dictate your actions? Would you stand your ground when making decisions? Would you defer to others? Would you become a leader or a follower? Now, imagine that the year is 1846. Modern technology does not exist. There are no official roads. Would you resort to eating human flesh if the choice was between that and death? With those questions in mind, you now need to pick up a copy of WHEN WINTER COMES. When you finish reading it, come back to my blog amiesbookreviews dot WordPress dot com and let me know what you thought and if after reading it, you have altered your answers to the questions above. One of the most gruesome and thought provoking PBS mini-series I ever watched was about the Donner Party and push to go west to California. It uses real diaries written by the survivors and photographs from the time. Well researched, it is a gut wrenching and sorrowful piece of American history brought on because a bunch of men decided to take a short-cut. When Winter Comes by V.A. 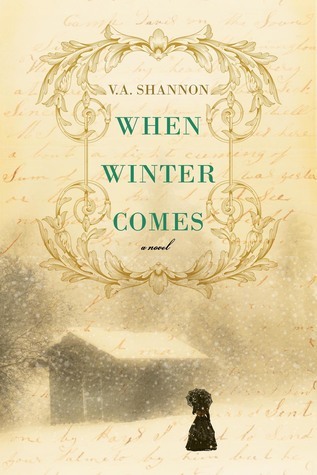 Shannon is a period novel told about this fatal excursion from the first hand experiences of young woman from Cinci One of the most gruesome and thought provoking PBS mini-series I ever watched was about the Donner Party and push to go west to California. It uses real diaries written by the survivors and photographs from the time. Well researched, it is a gut wrenching and sorrowful piece of American history brought on because a bunch of men decided to take a short-cut. When Winter Comes by V.A. Shannon is a period novel told about this fatal excursion from the first hand experiences of young woman from Cincinnati from a broken home who decides to escape her horrible life by joining the wagon trains west to California to start a new life. She happens to find a wagon train setting up for the trip west- and the Kesebergs- a real life family whose names are known as part of the Donner party. She is ‘hired’ by the Kesebergs to help watch the children along the journey. She never gives her real name during the book which lets the author have some poetic license with the character. The book has italicized sections which are set in present times when the narrator remembers her trip out West and wants to set the story straight about what really happened with the Donner and Reese party. Her name in the book is Mrs. Jacob Klein, her married name in California, where she works as a school teacher and is a loving mother and wife. I didn’t enjoy the sections about her life in California and think they could have been shortened or some even eliminated. What I did love was the meat of the story-the struggle to make it out to California and what they experienced along the way. I could tell this book was researched thoroughly. It immerses the reader into the sights, sounds, and smells of the journey along with the character of the personalities involved. It is a fictionalized account of what went on but it seems to me to be highly plausible. It does not hold back when it comes to describing the horrific starvation and what they had to do to survive. It is not sugar-coated. The voice of Miz Klein is strong and tough. I loved her character. Excellent read about the trials and tribulations of the ill-fated Donner party that started out happily enough from. Cincinnati,Ohio in the 1850's on their way to a new and better life for their family and kin in California. I truly have read none,that has held my interest more than this rendition by V.A. Shannon. Would definitely recommend as a fascinating read for anyone interested in early Pioneer History. My s Excellent read about the trials and tribulations of the ill-fated Donner party that started out happily enough from. Cincinnati,Ohio in the 1850's on their way to a new and better life for their family and kin in California. "California is the land of brave souls who adventure "Hunger is an evil thing!" This is definitely not my typical read. Shannon describes the journey of a group of hopeful people trying to get to California for a better life. I was very empathetic every step of the way. Unfortunately, I forgot that one of the families was the Donner Party and what they did to survive that winter. One particular passage still has my stomach churning. I also liked how Mrs. Klein, the respectable mayor's wife kept her past secrets to herself. The author brings to light the preciousness of life, hope, and despair. I have never read anything about the Donner party—avoided it until now. Definitely worth reading. Through the whole novel, we never learn her real name. I didn’t connect with this main character at all. From the start, I couldn’t like her. She came across as secretive, manipulative, and selfish. So, for me, there wasn’t as much if a Mrs. Jacob Klein’s husband of thirteen years has gifted her a journal, promising to never ask what she writes in it. In the privacy of those journal pages, she writes about how her experience as a fifteen-year-old young woman as part of the ill-fated Donner Party. Well worth a read for anyone who who enjoys historical fiction that is engrossing for a mixture of reasons, with a very individual and well researched basis. The story follows Mrs Klein, both in present and in past. At being presented with a Journal by her husband, Mrs Klein begins to recount her experiences, and how she came to be where and who she is. The mixture of past and present gave a very individual perspective of the main character, and I was left unsure as to my feelings about her. She w Well worth a read for anyone who who enjoys historical fiction that is engrossing for a mixture of reasons, with a very individual and well researched basis. The mixture of past and present gave a very individual perspective of the main character, and I was left unsure as to my feelings about her. She went through a lot, and by the present has an entirely different outlook on life. I enjoyed seeing how she became the person we initially see, and the History she was a part of was intriguing but harrowing to hear about. Others have mentioned books on the same topic, but for myself this is the first time I have heard about this family, and it has interested me enough to consider reading further into the subject. Others who had the same experiences have lied or told half truths to avoid telling people what happened to them, and our main character opts to never speak of it rather than lie. Finding the reasons and what it was exactly that she was worried about admitting to, was a not entirely comfortable thing to learn about. However, I did find it very interesting to see how people react when taken to extreme limits of survival. Certainly a book that has captured my interest, I can see myself rereading this in the future, and despite having read a happier book after, this is still in the forefront of my mind. Startled at learning of the fates of two men who had saved the Donner Party and angry towards the litany of articles written by so-called survivors, Mrs Klein begins a journal, assured in the truth of what really happened. From there, the story bops between the journal (where she starts to see signs of unrest, misdirection, suspicious of others cutting corners, scaling down of cargo and provisions, before devo When Winter Comes by V.A. Shannon is a free NetGalley ebook that I read in mid-October.